Household air pollution from traditional modes of cooking in rural India claims close to a million deaths every year. 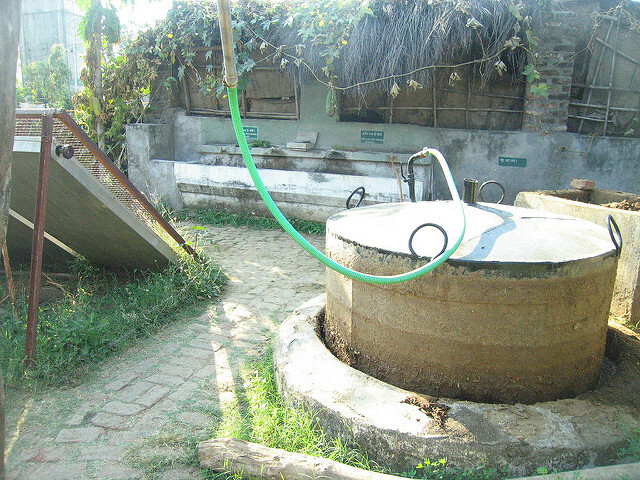 Biogas, generated from cow dung, is considered a form of renewable energy and offers a clean and smokeless cooking solution to rural households. The total spending on this project will be close to 22 crores on the project. Over a 10-year period, the project is expected to generate biogas equivalent to about 1 million cylinders of domestic LPG. SKG Sangha, a Karnataka-based NGO with experience in implementing biogas projects has been chosen to be the implementation partner for this project. Through this partnership, Infosys will train the beneficiaries in maintaining the biogas digesters and monitoring their performance. The project was inaugurated by Mrs. Sudha Murty, Chairperson of the Infosys Foundation, India, in Channapatna. Guests of honour Mr. D. K. Suresh, Bangalore Rural MP, Mr. Ramadas Kamath and Mr. Bose Varghese from Infosys were also present at the inaugural event. The President of SKG Sangha, Mr. Vidya Sagar Devabhaktuni and the President of the local panchayat, Mr. K. P. Raju were also present at the inauguration. This biogas project will give the beneficiary families a better and healthier lifestyle through clean and fast cooking for many years. The project will not only create socioeconomic benefits to the communities, but is also aimed at significantly contributing to the fight against climate change by reducing greenhouse gas emissions. It is worth mentioning here that Infosys is a global leader in sustainable development and became the first Indian company to join the global RE100 campaign. Aiming to become carbon neutral by 2018, the company is working towards reducing its per capita electricity consumption by 50% from its 2007-2008 levels and source all its electricity from renewable resources by 2018.